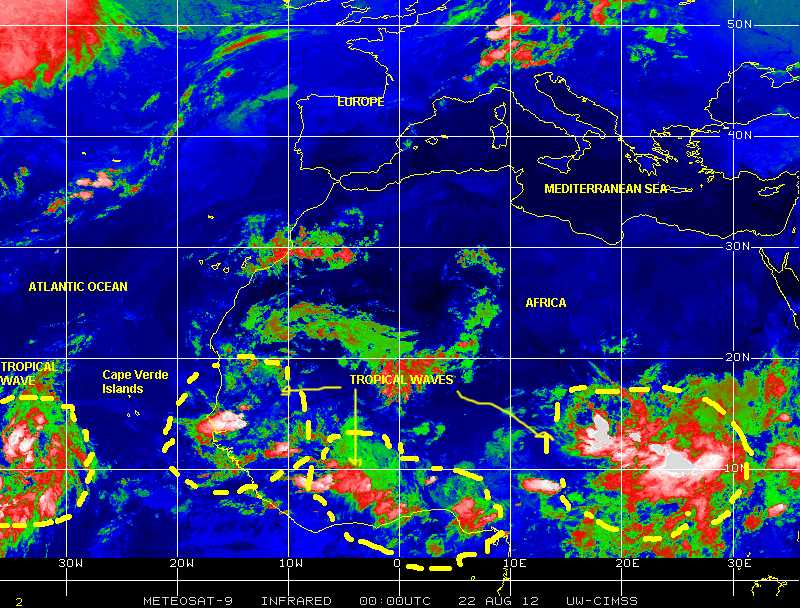 A lot has happened in the northern tropics in the week since we posted an article, in which we indicated 20 August marked the historical “opening” of the peak of the Atlantic hurricane season! First there was tropical depression seven in the western Caribbean, which traversed portions of Central America and the Yucatan peninsula emerging over the Bay of Campeche, in the southwestern Gulf of Mexico, to become Tropical Storm HELENE, which in turn spawned another tropical wave that on this 21 August lingers just off the eastern coast of Mexico in the western Gulf. Then there was Hurricane GORDON over the open waters of the Atlantic, which weakened to tropical storm strength before impacting the island of Santa Maria in the Azores, before continuing to lose strength as it entered much cooler waters near northwestern Africa and the Iberian peninsula in southwestern Europe. Next, just like clockwork, one of two tropical waves riding along Hurricane Alley became Tropical Depression #9 and today, 21 August 2012, it became the ninth-named tropical cyclone of the 2012 Atlantic hurricane season under the name of ISAAC, which at 2200 EDT was some 640 km east of Guadeloupe in the Lesser Antilles moving toward the west at 25 kph with maximum winds of 65 kph. 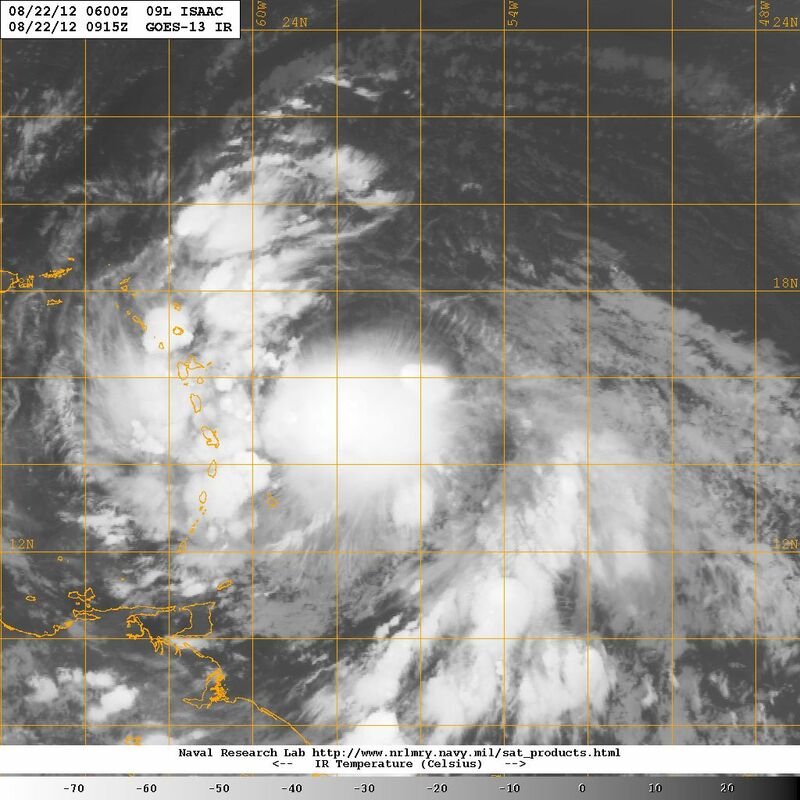 Tropical Storm Isaac appeared quite disorganized and ragged as the hour approached 2400 EDT, but it had a large wind-field as it continue moving toward the Lesser Antilles and the Caribbean into an environment of very warm surface waters and atmospheric conditions that may favor further strengthening and cyclonic development over the next 48-72 hours. Following is a five-day forecast track based on the model consensus as of 2000 EDT on 21 August 2012, which places the storm over Cuba and moving toward the Gulf or Western Florida near the end of the 120-hour forecast period. In this regard it should be of interest to note that at least one of the models is forecasting a more westerly track, which takes Isaac toward the Yucatan peninsula and the coast of Quintana Roo in Mexico. Chasing Isaac along Hurricane Alley is a large tropical wave that at 2200 EDT was located some 650 km South Southwest of the Cape Verde Islands and moving west at more than 30 kph. 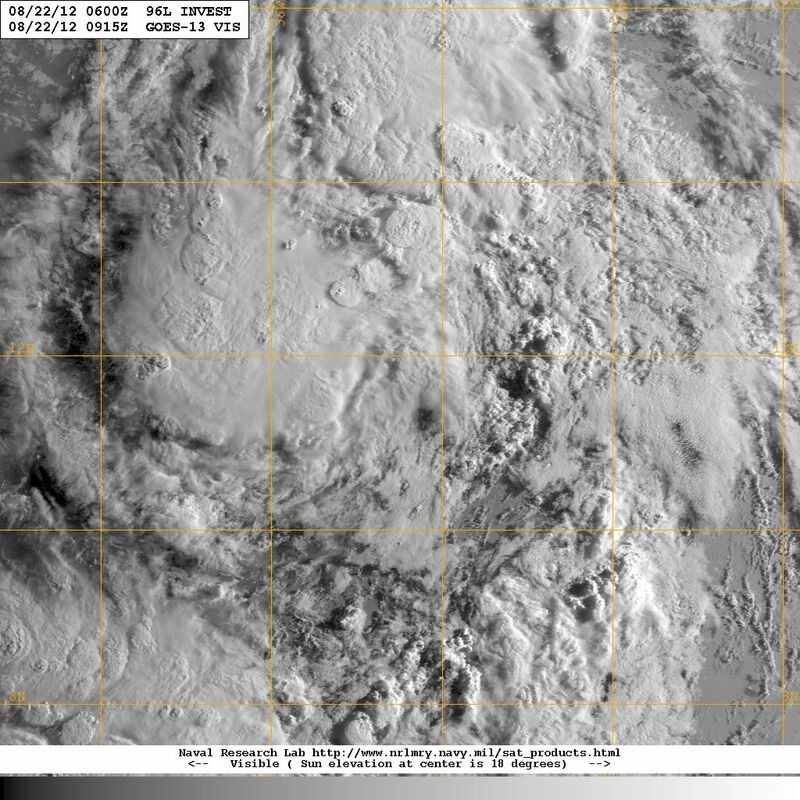 This particular tropical wave is showing signs or getting better organized and stronger around a cell of low pressure, and as of 2000 EDT this 21 August was given a 70% chance of becoming a tropical cyclone within the next 48 hours by the National Hurricane Center of NOAA. Still farther to the east, over the eastern Atlantic and the Tropical Wave Assembly Line in Equatorial Africa the generation of storm cells and westerly tracking tropical waves continues in full, raising the probability that still more of these tropical cyclone seedlings may continue to emerge over the eastern Atlantic and into Hurricane Alley over coming days just as as Florida, and the nation, gets ready to commemorate the 20th anniversary of Hurricane Andrew this Friday 24 August. Half a world away from Florida in that hot spot of cyclogenesis over the Philippines Sea and the South China Sea two tropical cyclones, Typhoon TEMBIN and Typhoon BOLAVEN are menacing Taiwan and China, beyond, in a region that has seen repeated tropical cyclone impacts over the past several weeks. Following are projected five-day tracks for both of these two tropical cyclones. As we monitor the progress of the 9th named storm of this 2012 Atlantic hurricane season, as well as other potential tropical cyclones moving into position along Hurricane alley and Equatorial Africa, let us remember that 20 years ago in 1992 by 21 August we had not had a single named storm in the Atlantic basin. Likewise, let us not forget that all it may take is just one hit from a tropical cyclone to cause catastrophic damage, death, injury and unimaginable human suffering. Those of us who went through Hurricane Andrew or worked in its aftermath can certainly attest to that. Pay Attention! Be Prepared! And above all MITIGATE!! 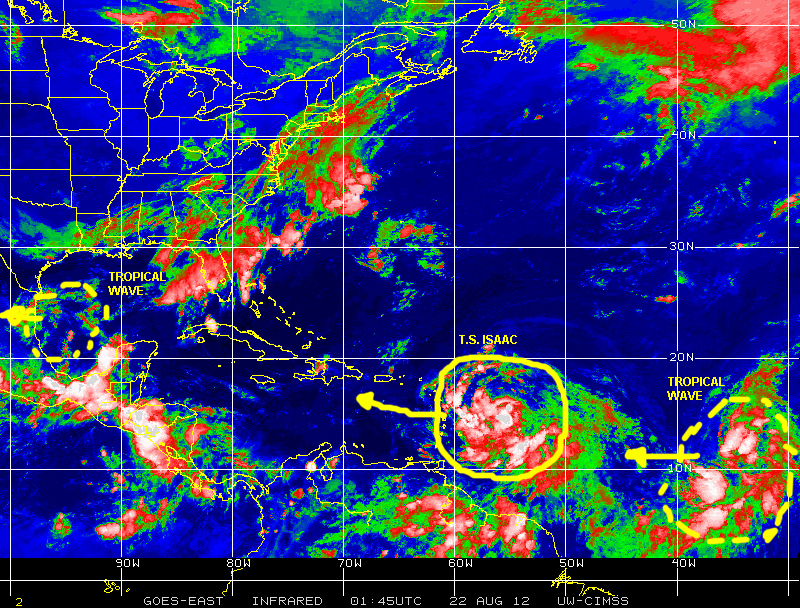 All interest in the Caribbean should monitor the progress of both these storms closely over the next few days. For those in the USA, especially in Florida, the possibility of approaching tropical cyclone conditions around the beginning of the week of 27 August exists. Pay attention, be prepared. MITIGATE!